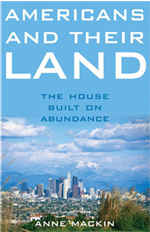 Until the twentieth century, making land cheaply available—or free after the Homestead Act of 1862—was the only social welfare policy of the federal government. It served brilliantly to provide home, property, and livelihood to many—though the larger share of the population remained disenfranchised [women and African Americans]… Today we have a different economy, a more sophisticated social understanding, and no such abundance of land. We now find that the rescue of the poor and the lower middle class has become a more complicated and burdensome enterprise. Perhaps our modern failure to fund social welfare more comprehensively or to fund education or health care programs, except minimally and grudgingly, is to be expected of a society for whom surplus land originally substituted for social policy. Let’s look at the effects again of greater numbers of people in America sharing resources. Land and housing prices rise. Our access to natural resources is more limited. Common resources such as air and water become degraded. Despite multiplying conveniences and luxuries, the quality of our lives declines in certain ways: we work longer hours, for example, and spend more time in our cars commuting. Our economy grows larger, more complex, and apparently more productive, and its industries and corporations grow, too, gaining sway over our institutions and agencies of government. Inequality rises. Technology expands for the increasingly difficult and complex harvest of diminishing resources, while its deleterious effects on resources go largely unmonitored, and a limited number of people profit… America’s task in the 21st century is to address and redress these trends.